November | 2014 | On The Road in Florida With Idelle! 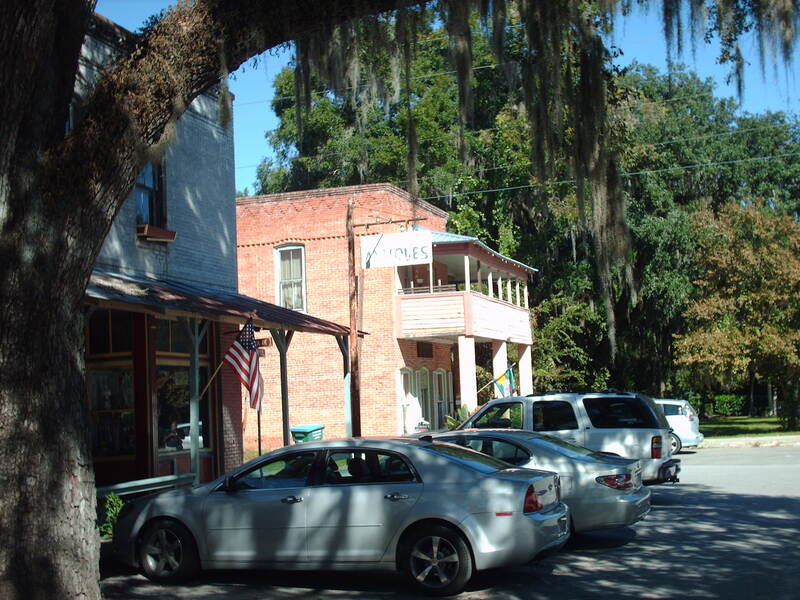 Micanopy founded in 1821 and named after Chief Micanopy leader of the Seminole Indians. 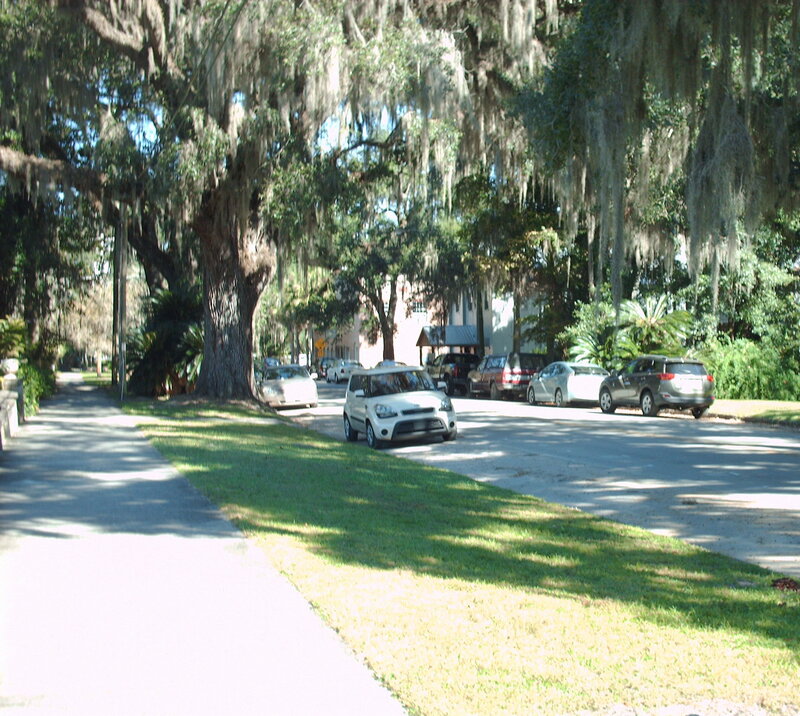 Micanopy a small town near Gainesville where time stands still and made famous by the movie Doc Hollywood featuring Michael J. Fox. A historic district whose commercial buildings and homes are on the National Register of Historic Places. A Florida Heritage Historical Marker gives a detailed history of the town. You can take the turnpike or go north on Highway 441 that will take you through small towns. 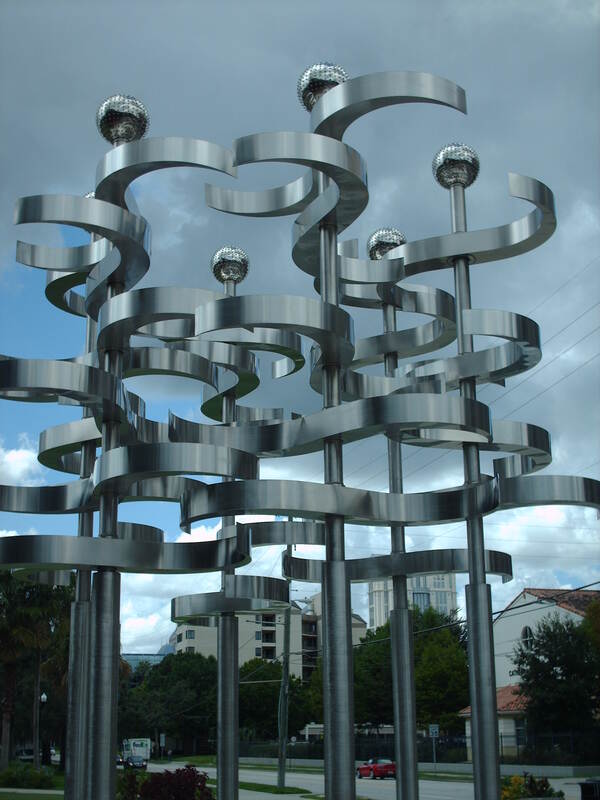 Muse of Discovery, Cedars of Lebanon and Centered some of the sculptures on display at Lake Eola Park in Orlando. Two sculptures located in the center of town. I went in the early evening when it was still very warm but not crowded. Each sculpture has a plaque that describes the art. “Centered” by C.J. French of Hood River, Oregon. 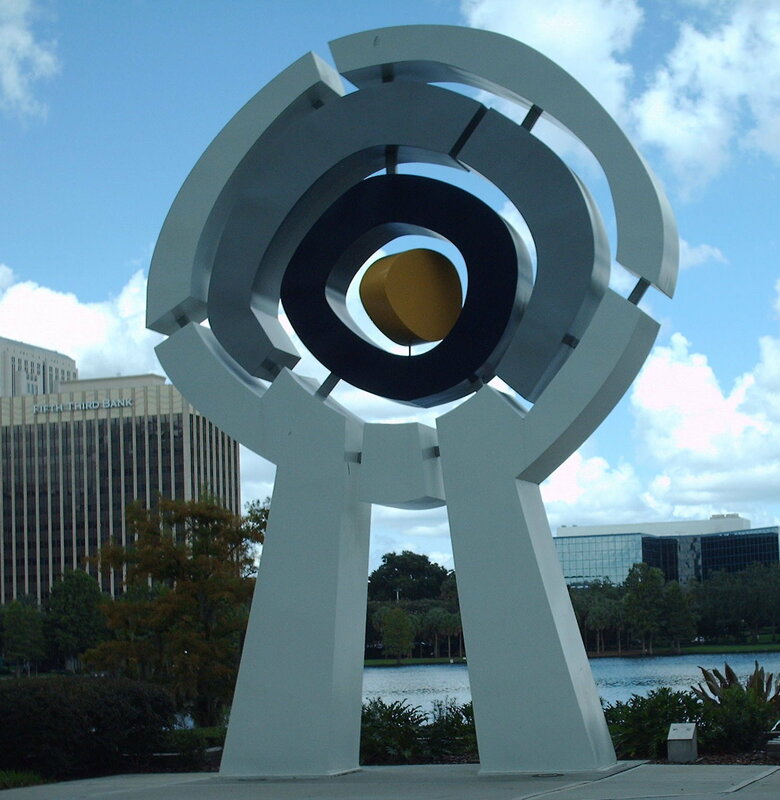 The sculpture depicts Orlando as the epic center of family fun, creating lifetime experiences and endless memories. Does the yellow form represent the sun? “Union” by Ralfonso is a Kinetic Stainless Steel Wind Structure that has thirty wings. Kinetic art depends on movement for its effect. Born in Switzerland Ralfonso now resides in West Palm Beach. 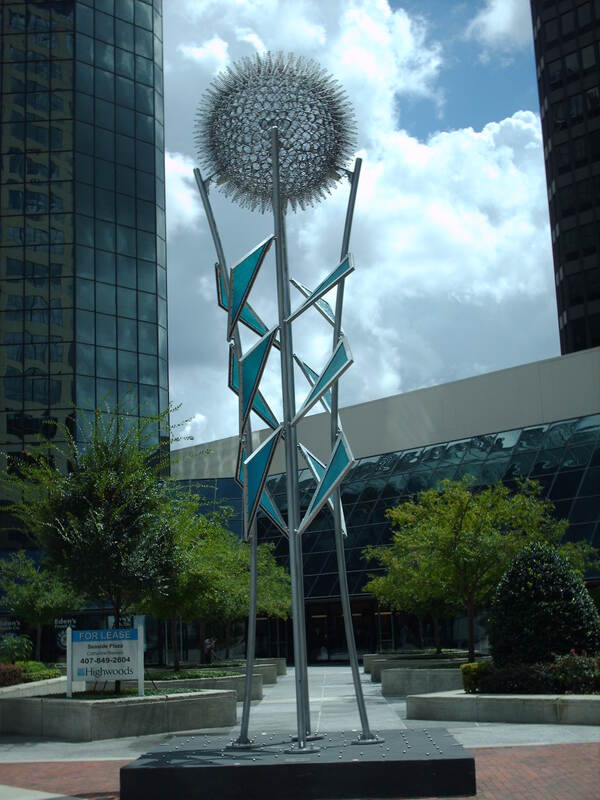 Most of his large kinetic sculptures appear in public places throughout the U.S., Europe, Asia and United Arab Emirates. 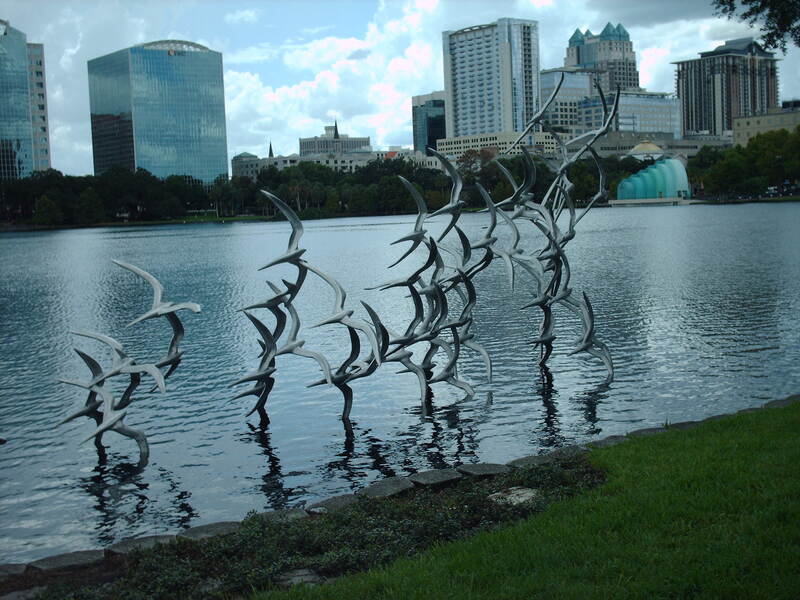 “Take Flight” by Douve Blumberg. The sculptor is made of aluminum and magnesium. I describe it as birds taking flight. Douve Blumberg has received many awards and commissions throughout his career. Douve Blumberg lives in Demossville, Kentucky. 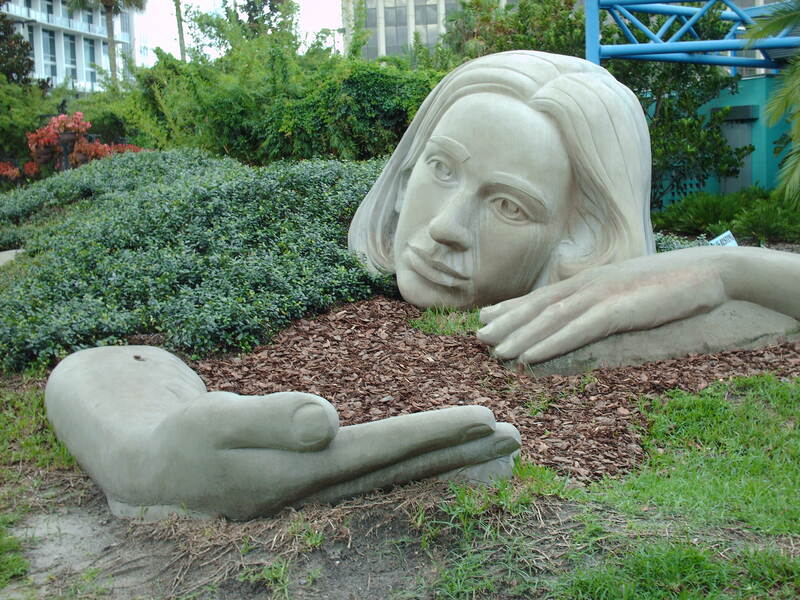 “Muse of Discovery” by Meg White is made of limestone and earthwork. Earthwork is a large, artificial bank of soil. What is a muse? In Greek mythology, in poetry and literature they were the goddesses of literature, science and the arts. Most of the work she produces are large and of a figurative nature. Meg White lives in Stephensport, Kentucky. and is the national emblem of Lebanon. “Monument in Right Feet Major” is a bronze sculpture by Todji Kurtzman who lives in Portland, Oregon. His art considered movement art. Whether its a painting or sculpture art is perceived as beauty in the eyes of the beholder. 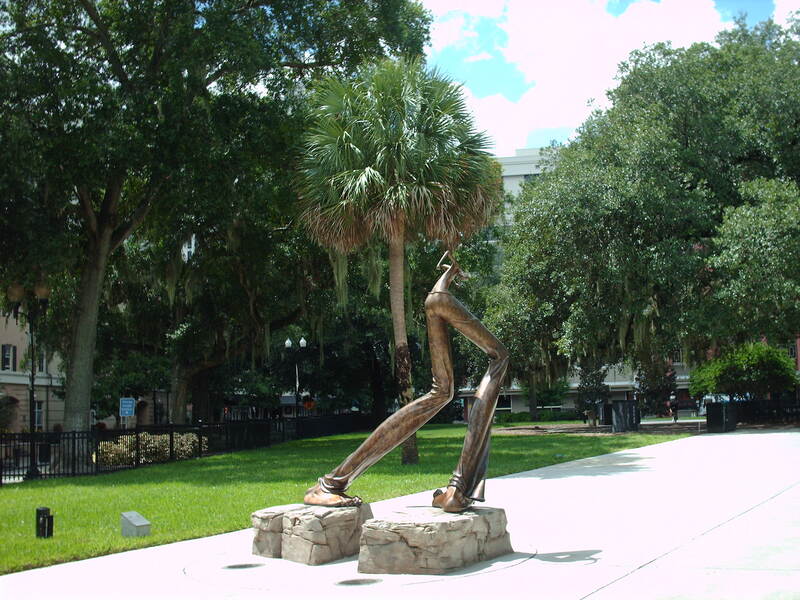 I see his sculpture as a man whose feet are firmly on the ground but turning and twisting as in a dance. 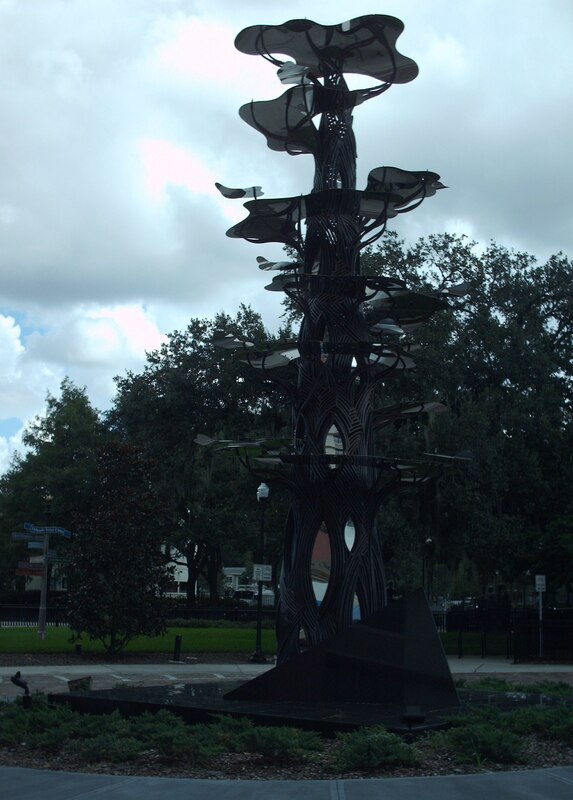 “Global Convergence” is a solar powered LED light sculpture by Deedee Morrison and is located at the front of the Orange County Regional History Center. Her art form considered installation art that is three-dimensional, shaped like a globe and emits light from solar power. Her works displayed throughout the United States. She lives in Birmingham, Alabama. 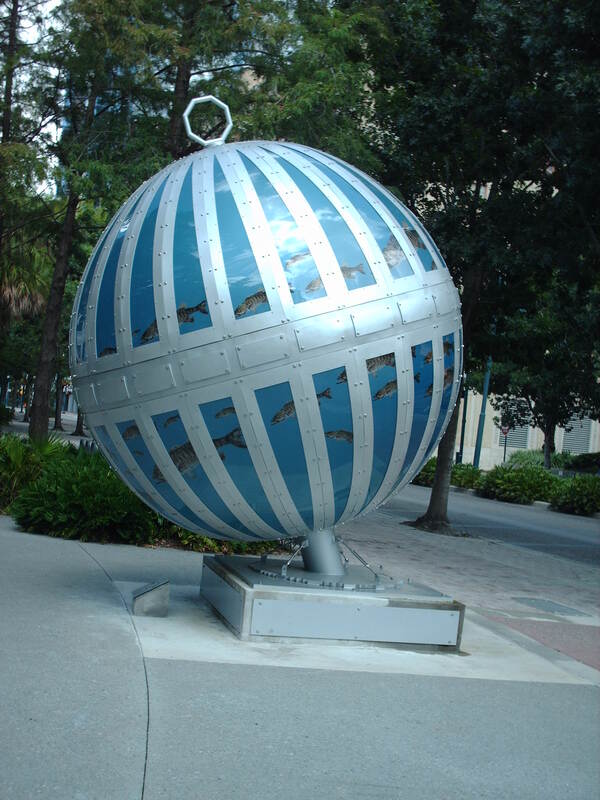 “AstroGenesis II – The Birth of Stars” by Wendy M. Ross is at the corner of Church Street and Orange Avenue. It is a kinetic structure, which lights up by LED light. Kinetic sculptures depend on motion for its effects. The ball is made of steel. Wendy owns a sculpture studio “Ross Sculpture Studio”, LLC in Bethesda, Maryland. 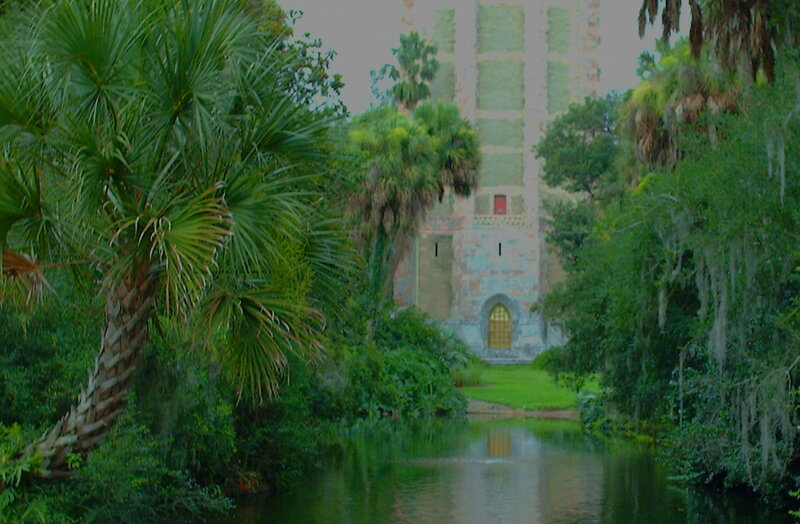 Bok Tower Gardens located at 1151 Tower Boulevard in Lake Wales. Listed on the National Register of Historic Places an oasis of calm and relaxation. Frederick Law Olmstead, Jr. designed the gardens. The beautiful gardens and the daily concerts from the Singing Tower make for lifelong memories. Stroll through the gardens and view the River of Stone which house Tillandsia commonly known as air plants. Thirty different varieties of the plant grow throughout the gardens. Hike the nature trails and relax at the reflection pond. In spring, 150 varieties of plants are in bloom. Several unique gardens, which include Oriental Moon Gate, Frog Fountain, Vegetable Garden and the Grotto. 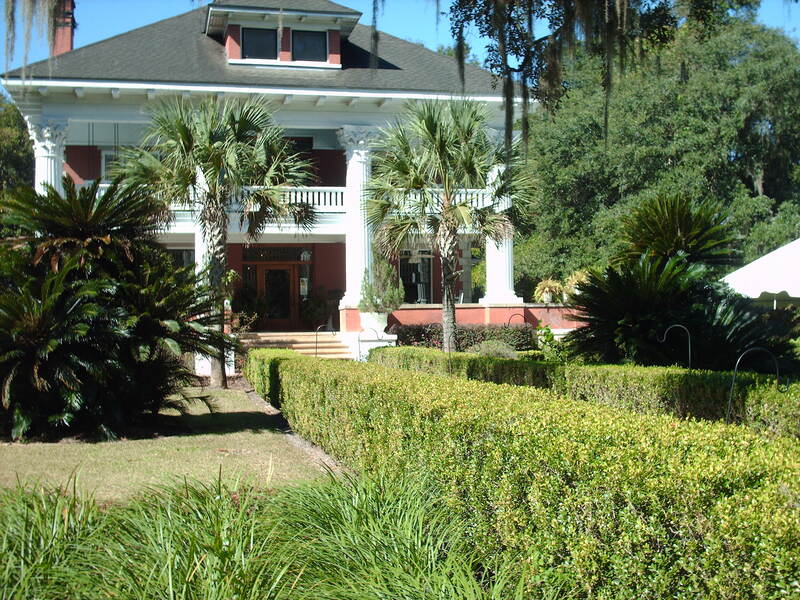 Take a Historical tour of Pinewood Estate a 20-room mansion. Built in the 1930s for Austin Buck a Bethlehem Steel executive. Entrance fees and hours of operation on the website. Ringling Brothers Mansion and Museum located at 5401 Bay Shore Road in Sarasota. John and Mable Ringling built the mansion in the early part of the 20th century. They named the mansion Cà d’Zan that means the House of John. After touring Italy for a year John and Mable decided to build their 30-room mansion to resemble the Venetian palaces. Palm Trees and a Banyan Tree native to India line the long walkway as you approach the mansion. Sculptures along the entrance of the mansion, Rose Garden and Gazebo. 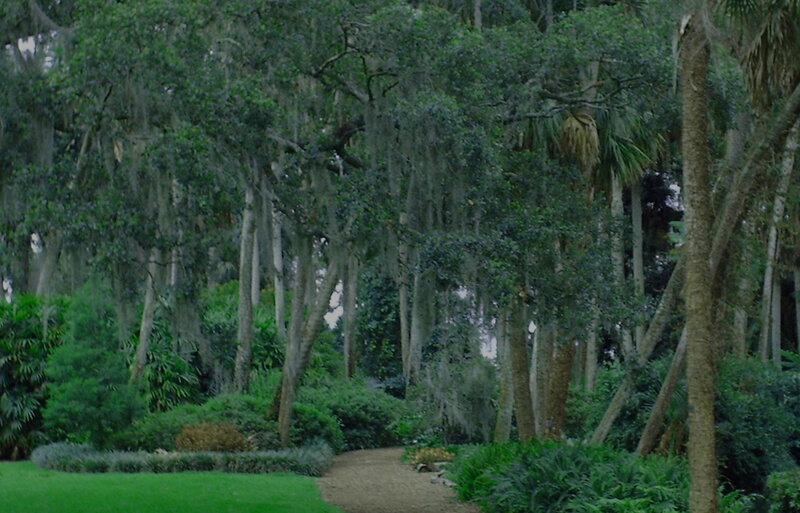 After John died, he willed his mansion, art museum and his extensive art collection to the State of Florida. The museum listed on the National Register of Historic Places. John and Mabel Ringling collected over six hundred pieces of art during their years of traveling throughout Europe. Entrance fees and hours of operation on the website.